The stress of travel, the re-circulation of air from planes, the dreaded seat neighbor, and altered sleep schedules can put added stress on our immune system. Luckily, there are several supplement recommendations which can help support a healthy immune system that may often be overlooked. * These recommendations can easily be incorporated into a daily plan of action or be taken seasonally as needed. For centuries, the fruit of the elderberry has been one of the top traditional remedies for supporting a healthy immune system. * Elderberry fruit contains flavonoids, and carotenoids. * In a randomized, double blind, placebo-controlled study published in the Journal of International Medical Research in 2004, elderberry extract proved to be an effective, tolerable, and cost-effective extract.1 For the study, 60 Norwegian subjects received 15 ml of elderberry or placebo syrup four times daily for a five-day period. Elderberry syrup tastes great, making it perfect for kids as well. Looking for additional information on probiotics? Download these educational resources on Bifidobacterium and Lactobacillus. Sleep and the circadian rhythm are intimately connected to the immune system. Circadian rhythm regulates autonomic activity and influences multiple processes including gastrointestinal, endocrine, and cardiovascular function. Recent research has also shown that even gut microbiota are regulated by circadian rhythm and just two days of sleep deprivation can provoke dysbiosis.14 Circadian rhythm is managed in part by oscillatory activity in central and peripheral tissues, and also in part by the suprachiasmatic nucleus or SCN of the hypothalamus. 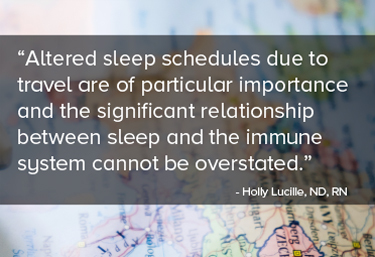 The timing, however, of circadian rhythm is controlled by light-aka the sleep/wake cycle.15 Traveling, especially across time zones, can result in interrupted sleep, bringing with it misaligned circadian rhythms, a phenomenon commonly referred to as jet lag. The entrainment of circadian rhythms to synchronize with a new time zone can take days, generally one day per hour of time difference. Good sleep hygiene consists of providing an optimal environment for restful sleep. Even artificial light can cue the SCN in the hypothalamus and disrupt circadian rhythms, with common offenders being bright light and electronic devices that emit blue light. Using a blue light filter, avoiding use of electronic devices in the few hours before bedtime, and sleeping in a darkened room can prevent this from occurring. Conversely, exposure to artificial light within thirty minutes of awakening can support circadian alignment with the sleep/wake cycle, either through exposure to a partly cloudy morning, a brightly lit room, or an equivalent of 800 LUX from a light box. Good sleep hygiene should also include digestive care. Minimizing late night eating allows the gut to rest, as well as counter the increased caloric intake associated with sleep disruption.16,17 Likewise, another good rule of thumb is to also avoid the consumption of alcohol, caffeine, and sugary foods before bed. Zakay-Rones Z1, Thom E, Wollan T, Wadstein J. . Randomized study of the efficacy and safety of oral elderberry extract in the treatment of influenza A and B virus infections. J Int Med Res. 2004 Mar-Apr;32(2):132-40. Langkamp-Henken B, Rowe CC, Ford AL. Bifidobacterium bifidum R0071 results in a greater proportion of healthy days and a lower percentage of academically stressed students reporting a day of cold/flu: a randomized, double-blind, placebo-controlled study. Br J Nutr. 2015 Feb 14;113(3):426-34. Castro-Diehl C, Diez Roux A, Redline S, et al. Association of Sleep Duration and Quality With Alterations in the Hypothalamic-Pituitary Adrenocortical Axis: The Multi-Ethnic Study of Atherosclerosis (MESA). J Clin Endocrinol Metab. 2015. 100(8): 3149-58. Dimitrov S, Lange T, Tieken S, et al. Sleep associated regulation of T helper 1/T helper 2 cytokine balance in humans. Brain, Behavior, and Immunity. 2004. 18:341-48. Axelsson J, Rehman J, Akerstedt T, et al. Effects of sustained sleep restriction on mitogen-stimulated cytokines, chemokines and T helper 1/ T helper 2 balance in humans.. PLoS One. 2013 Dec 11;8(12):e82291. Dinges D, Douglas S, Zaugg L, et al. Leukocytosis and Natural Killer Cell Function Parallel Neurobehavioral Fatigue Induced by 64 hours of Sleep Deprivation. J Clin Invest. May 1994. 93:1930-39. Prather A, Janicki-Deverts D, Hall M, et al. Behaviorally Assessed Sleep and Susceptibility to the Common Cold. Sleep. 2015. 9(38):1353-9. Cohen S, Doyle W, Alper C, et al. Sleep Habits and Susceptibility to the Common Cold. Arch Intern Med. January 12, 2009. 169(1):62-7. Vgontzas AN, Pejovic S, Zoumakis E, et al. Daytime napping after a night of sleep loss decreases sleepiness, improves performance, and causes beneficial changes in cortisol and interleukin-6 secretion. Am J Physiol Endocrinol Metab. 2007 Jan;292(1):E253-61. Faraut B, Nakib S, Drogou C, et al. Napping Reverses the Salivary Interleukin-6 and Urinary Norepinephrine Changes Induced by Sleep Restriction. J Clin Endocrinol Metab. 2015. 100(3): E416-26. Lee E, Jin Cho H, Olmstead R, et al. Persistent Sleep Disturbance: A Risk Factor for Recurrent Depression in Community-Dwelling Older Adults. Sleep. 2013. 36(11):1685-91. Broussard J, Ehrmann D, Van Cauter E, et al. Impaired Insulin Signaling in Human Adipocytes after Experimental Sleep Restriction: A Randomized, Crossover Study. Ann Intern Med. 2012. 157(8):549-57. Grandner M, Jackson M, Pak V, et al. Sleep disturbance is associated with cardiovascular and metabolic disorders. J Sleep Res. 2012. 21(4):427-33. Benedict C, Vogel H, Jonas W, et al. Gut microbiota and glucometabolic alterations in response to recurrent partial sleep deprivation in normal-weight young individuals. Molecular Metabolism. 2016. 5: 1175-86. Grimaldi D, Carter J, Van Cauter E et al. Adverse Impacts of Sleep Restriction and Circadian Misalignment on Autonomic Function in Healthy Young Adults. Hypertension. 2016. 68:243-50. Spaeth A, Dinges D and Goel N. Effects of Experimental Sleep Restriction on Weight Gain, Caloric Intake and Meal Timing in Healthy Adults. Sleep 2013. 36(7):981-90. Hibi M, Kubota C, Mizuno T et al. Effect of shortened sleep on energy expenditure, core body temperature and appetite: a human randomized crossover trial. Sci Rep. 7:39640. Yamadera W, Inagawa K, Ciba S, et al. Sleep Biol Rhythms. 2007;5:126–31. Bannai M, Kawai N. J Pharmacol Sci. 2012;118(2):145–8. Mishima K. Nihon Rinsho. 2012 Jul;70(7):1139-44. Mundey K, Benloucif S, Harsanyi K, Dubocovich ML, Zee PC. Sleep. 2005;28(10):1271–8. Zhdanova IV, Wurtman RJ, Regan MM, et al. J Clin Endocrinol Metab. 2001;86(10):4727–30. Hairmov I, Lavie P, Laudon M, et al. Sleep. 1995;18(7):598–603. Birdsall TC. 5-Hydroxytryptophane: Altern Med Rev. 1998;3(4):271–80.